Glory be, sweetness and light, it’s another DA this week. Comment away below, but no spoilers until Monday on this particular thread. Cunning theme this week. I had to resort to Google early on. Was stuck for a long time, I had 12A, 22A and 26A but couldn’t make the connection. Love a DA that challenges, feels like more of an achievement when you get to the end! I really don’t like it when I have to resort to Google. There were a few of the themed answers I hadn’t heard of as well as the answer to 1D. 9A was my pick of the clues. I found this all quite syraightforward after seeing the tallest [theme] in Tas as my first answer. but some clever clues including 9A, 11A and 24D. first theme answer I got was 14A which set me off looking for islands. Then got 17A and 26a which had me going for emotions but couldn’t see the connection with 14A. 22A in next didn’t help much either. Then 11A gave me the theme so have a few more. Quibble with the location of 1A which I’d heard of and thought had something to do with the answer, but it is on the wrong side of the river! Bottom left corner is a complete blank at the moment, will press on. Cancelled the papers and went fishing and whale watching – no Pods. Picked up tomorrow’s fishwrap from bait shop. Alarmed to see – or not, initially – a theme, without aids or Trippers. Worked out most of the theme from wordplay, but not the SE .. gushing? layperson? 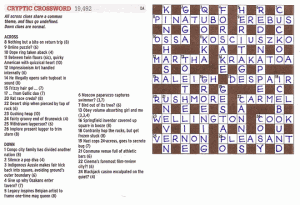 Confess to having taken “Puzzled” with me, and the early morning read gave me 9A and 18D. After buying the Sat SMH on the way home used up several kilometres (as passenger) trying to figure out the wordplay for the misprinted solution to 24D. Some very good deceptions today, and nice mix of clue types and difficulty (for me). Another enjoyable puzzle with a good mix of challenge and achievability (for me). Particularly liked 9a, 11a, 4d and 5d. 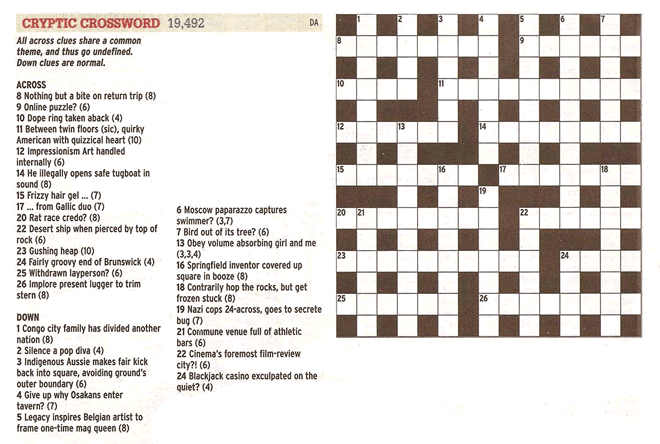 Oddly enough, RobT, the Age general knowledge crossword, adjacent to DA on Saturday, included “What is the highest peak in Tasmania?” It’s Ossa. Which were your first acrosses? First off I got RALEIGH, which made me think of explorers and US capital cities. Next came COOK, which made me think of explorers. Then WELLINGTON, which made me think of famous Poms. Finally, OSSA, which eventually clued me into the bumpy land features, and which made me solve the rest of the crossword in about 20 minutes. First: I went COOK, which made me think of islands and professions. Next: RALEIGH, which made me think explorers. Next: MARTHA, which made me confused, because I had never heard of Mount Cook or Raleigh, but I had heard of Mount Martha. Next: CARMEL, and I had no idea what that was, so I cheated and discovered it was a mountain, by which time I was thoroughly underwhelmed and spluttered through a few more clues before losing interest in continuing. Nice theme this week – once I got away from girl’s names! Doing it whilst relaxing at the Masters Games in Adelaide. Was struggling a bit until I enlisted the help of HR and ES – missing you JK! This one was nearly Poolroom for me, but the icing on the cake was 17a, sitting –as I was–in a cottage in the woods at the base of 17a. And could someone please explain the “square” in 16d? I meant loved…24a etc. Once again let down by the size of my finger and my tiny phone keyboard ! The easy clues across (for us) were raleigh, cook, carmel, martha & despair. The genius of this is that there really are a wide variety of potential themes here (I was feeling smart that it was regional US cities & counties until I got to depair). 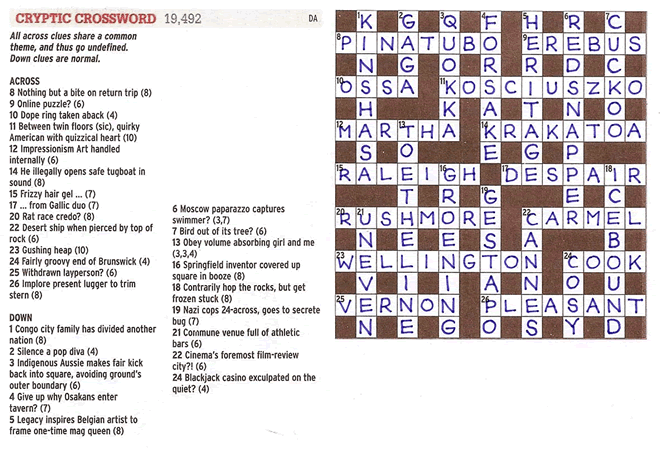 Once it was clear that that the theme was mountains the rest were all fairly guessable & that is also the weakness of a themed crossword – it fell into place quickly leaving very little to ponder over on a (non AFL )Melbourne Saturday evening & Sunday morning. Hence relative paucity of posts on other theme. GB & (? JG) I am also missing you & the basketball. Are you doing the daily Times crossword each day in the Australian? Should keep you out of trouble.